Immunogen: Synthetic peptide corresponding to human calcineurin A. 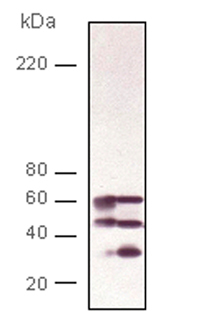 Application Notes: Detects a band of ~61kDa by Western blot. Scientific Background: Calcineurin is a Ca2+/Calmodulin-dependent serine/threonine protein phosphatase. The active enzyme is a heterodimer consisting of a catalytic A subunit and a myristylated regulatory B subunit that binds calcium. Calcineurin, which is the target of immunosuppressant drugs such as cyclosporin A and FK506, controls the translocation of Nuclear factors of activated T-cells (NFAT), a family of transcriptional activators that control the expression of cytokine genes essential to immune response, from the cytosol into the nucleus of activated T-cells. Western blot analysis of ADI-SPA-610: Lane 1: Rat Brain Lysate, Lane 2: Mouse Brain Lysate.